Cellulite (Gynoid Lipodystrophy) is the irregular, dimpled skin surface of the thighs, abdomen, and buttocks in 85% of posti-adolescent women. That is the scientific definition of it, but the bottom line is it’s something most women dread and go to great lengths to treat it. There are countless of treatments and remedies, So there is tons of opportunity to find one that is right for you. Unfortunately, there is no permanent cure for getting rid of this appearance. Besides a nutritious diet, and healthy exercise there are topical treatments that can help reduce the appearance. Dry skin brushing is really popular right now. It is meant to improve the circulation and should be done when the skin is dry. I found this video to be rather helpful. Another way you can help reduce the appearance is try to incorporate personal care rituals into your day. Here are some very simple recipes to try and perhaps add to your line. All of them include our great bases that are easy to use and have nourishing ingredients. Use this calculator to make an amount that fits your needs. Feel free to play with this recipe and make it your own. Nothing puts a pep in your step like a good cup of Joe. Why not put that pep in your skin? The caffeine in coffee stimulates the tightening of skin and the scrubbing stimulates circulation. 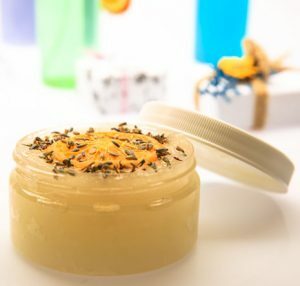 Here Is a simple recipe you can use to make an invigorating scrub. 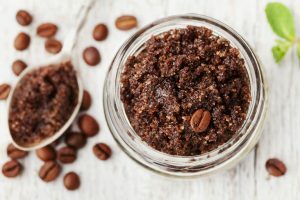 This recipe will be 59% sugar scrub, 40% coffee grounds, and 1% fragrance. Simply mix all the ingredients in a container suitable to your needs. We recommend using a coffee scented fragrance to compliment the grounds. Grapefruit is great for circulation! And it contains anti-inflammatory properties. Many people say adding the essential oil to a cream is good, however we don’t recommend citrus essential oil be left to sit on skin due to its photo sensitizing properties. If you do that you can be left more exposed to UV rays, and prone to sunburn. So we recommend making a grapefruit scrub instead! Simply mix all the ingredients in a container suitable to your needs. Again, all these remedies are temporary. There is no known permanent solution to the dreaded cellulite. So taking routine care of your skin is the best way to lower the appearance.